I fully realize that there are some damn good people who fully believe in socialism. Some, like Orwell, have the excuse that it hadn't been broadly applied such that it's inherent failures could be exposed for all the world to see - and even he, as time went on, began to change his views. It's no coincidence that 1984 and Animal Farm were eviscerations of totalitarian systems like the Soviet Union, or just in general. Others, well intentioned, not necessarily stupid, though likely being more than a little of what Nassim Taleb would label the "Intellectual Yet Idiot", haven't looked deep enough to the second order consequences of the pretty-sounding and pleasant goals that socialism is sold under. Not all of them are social justice warriors either. Increasingly rare, there are some intellectually astute socialists and liberals who don't buy into the SJW crap. So, again, despite some well meaning people who believe in it, socialism is inherently evil. Why? After all, isn't it just a set of ideas? How can ideas be inherently evil? Yes socialism is a set of ideas, and ideas that are not acted upon, any more than a gun that is not pointed at someone and the trigger pulled, are indeed just tools. But for the sake of this post, we're not talking about some abstract model that you can pick apart to see how it works, or doesn't. We are talking about a living, breathing ideology carried by living, breathing people who try to put it into practice. Yes. So? If I wish to make 100% of the population literate, I could do it the hard way and accept that not all children will be, but that we could get most of them. I could of course lie about the numbers and be only moderately evil, or redefine "literate" - though the number of children who are literate and the ones we call literate never will match up, and we've devalued trust, and meaning. I could also walk around killing every single child who does not meet the standard. That would give us 100% literacy - of the remaining population. And it would of course be the inhuman, evil way of achieving the goal. Don't we have a number of socialist systems in place in the United States? Welfare? Etc? We have almost the entire socialist party platform of the 30's in place right now! Yes, and many do more harm than good. It's the old "just because people are doing it" argument. Also note, that just because something is agreed upon as a "good" thing by socialists - namely, the government doing something - doesn't mean it's inherently bad. A competent evil overlord will have read the Evil Overlord List - and will do many things that are virtuous to build loyalty, build competence, etc., even if all of this is ultimately to evil purpose. Yes. Because it plays off of not only greed, but envy. Because it is against nature. 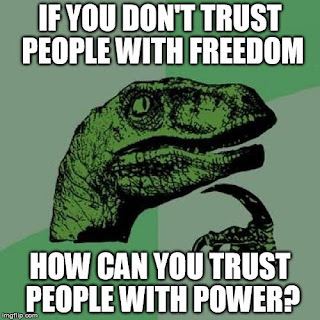 Because it doesn't allow for checks on the needed power structures to make it work. Look. Objectivism and Libertarianism play off of greed. In part, one argument is that self-interest in greed is easier to manage than the sins that underlie how socialism is sold. Of course, being utopian, they also require angels for them to succeed, but despite ignoring that people exist in a society, with friends and family, and are not individual atomic units, are nevertheless closer to the reality of nature with distributed power and distributed decision systems addressing the problems of the moment. Envy is a nasty, spiteful resentment. It is the projection outward of bitterness of self. Envy is a rejected acceptance of one’s own incapacity or lack of wealth, power, position or property. It is the involuntary transformation of the resulting disappointment into an ugly and pointless hatred of those who present examples of higher achievement. Envy is the failure to accept unsatisfied desire. It is a failure, more importantly, to accept personal responsibility for both that dissatisfaction and a demand for better achievement of desire through greater personal effort. Envy is the external flinging of suffering when the psyche is not strong enough to withstand adoption of this true ownership. Envy results in bitterness, in a curdled malevolence of heart. For their faults, freedom-oriented ideologies like Libertarianism eschew the poison of envy. If you want what someone else has, don't ruin their lives, don't cut them down to your level, and don't steal from them. Make your own! Since it is sold on envy. Everything that someone else has that you want is a source of pain that must be corrected by making things equal - and ultimately, that means an outside power must decide what is "fair", and take from those who have "too much" to give to those who have "not enough." Far too much ink has been spilled on the truth that this leads to the capable not working- one of the better ones being Stefan Molyneux's dissection of Thanksgiving, and how the Plymouth colony ended up in such dire straights in the first place - so I will not go into it here. It leads us though, into being against nature. Not only natural limits of what we know, but the nature of man. For socialism to work, one must assume that, if not all will work, then enough will work in the face of those who refuse to, to keep the system afloat. Despite much idealism, reality has yet to demonstrate such a trait. The opposite is not only eminently predictable, but has borne out, time and time again, and so of course force is needed to make people work. This again, requires a central organization to determine what is adequate "work", and who can be excused from it. Again, the central control - and that is another natural limit. Sure, in a family, it's possible to know enough of what's going on to decide what's best for the family as a whole and who can do what, and no functional family is a democracy (nor is it an authoritarian hellhole), but despite the illusion provided by games like Civilization, etc., we simply never can acquire the knowledge to judge for everyone in any sizable community, much less a nation. As much as individuals will make mistakes, many will manage to make OK decisions, and the scope of those decisions will be limited, rather than national. And central control brings us to the last point. Psychopaths, sociopaths, narcissists, and those who crave power over others are drawn to politics like moths to a flame. The greater the power, the greater the scope of control, the more attractive it is, and the more damage they can do to people's lives with it, while better guaranteeing they will never lose access to those levers. It's amazing that those who who are unwilling to trust people with the individual power inherent in freedom will trust people with power over thousands - because supposedly there's a vetting process. More than enough people can attest at how well sociopaths and narcissists can hide amongst people. That desire to retain that power and prevent challenges to it also underlies the observation in the United States that gun control isn't about guns - for their bodyguards, security services, and armies will still have them - it's about control. And ultimately, that need for control as people refuse to do what's "best for them/the country" as determined by the thought leaders, leads to the suffering, starvation, torture, and enslavement in job lots of one's own citizens, time after time after time.